We’d love your help. Let us know what’s wrong with this preview of The Girl from the Paradise Ballroom by Alison Love. Years later, on the dawn of World War II, when struggling Italian singer Antonio meets the wife of his wealthy new patron, he recognizes her instantly: it is Olivia, the captivating dance hostess he once encountered in the seedy Paradise Ballroom. Olivia fears Antonio will betray t The first meeting between Antonio and Olivia at the Paradise Ballroom is brief, but electric. To ask other readers questions about The Girl from the Paradise Ballroom, please sign up. This is one book that actually surprised me quite a lot. I don't read that much romance, but now and then do I like to take a break from reading crime and horror to read something a bit lighter. To be honest, I was not completely sold when it came to this book's story when I read the blurb. And, in a way, I was right about feeling a bit cautious when it came to the romance part of this book. But, I was wrong to think that this book wouldn't suit me. However, I will start with saying that I did n This is one book that actually surprised me quite a lot. I don't read that much romance, but now and then do I like to take a break from reading crime and horror to read something a bit lighter. To be honest, I was not completely sold when it came to this book's story when I read the blurb. And, in a way, I was right about feeling a bit cautious when it came to the romance part of this book. But, I was wrong to think that this book wouldn't suit me. However, I will start with saying that I did not care an iota about Antonio and Olivia's romance, I never found their first meeting especially memorable and the subsequent meetings over the years never interested me or even gave a hint of some memorable romance. In short, the main story, the romance between Antonio and Olivia bored me. However, the book had a much more interesting character and that was Antonio's sister Filomena. I liked reading about Filomena's struggle to be with the man she loved. It was far more interesting to read about than Antonio and Olivia's forbidden love. Filomena was the one character that made the book enjoyable for me. Filomena and the fact that I have never read about an Italien family in England during WW2 and what they had to go through. Half the family was for fascism and Mussolini and the other half, not too enthusiastic about it. And, I found it fascinating to read about how the Italians in England thought that Mussolini, il Duce, was the one that would make Italy great again. The last part of the book was my favorite part because here Alison Love decided to twist to story in a way I never expected it to go. Here, I became was so completely intrigued by the book that I couldn't stop reading it, despite the clock closing in on midnight. And, the worst part, I loved the ending, despite it being so darn saccharin! It was a wonderful book and I ended up enjoying it very much! I love this book. I'm a big fan of historical fiction and this book also throws in a large amount of romance too. In the US all we hear about is the Japanese internment camps but this book takes us into the internment of the Italian and other ethnic populations in Great Britain which I was unaware. This is the US debut for this author and if this book is any indication, I would say that she has a bright future. I highly recommend The Girl from the Paradise Ballroom by Alison Love. This one was disappointing for me. I wish I had read reviews before reading because if I had done so, I think that I would have had different expectations. What spoiled it for me was the description of the novel: The back of the book describes The Girl from the Paradise Ballroom as an epic romance between dance hall hostess, Olivia, and an Italian singer, Antonio, who fall in love in the years before WWII. My problem was that I found Olivia and Antonio's relationship to be lacking. There were few scenes of them together before they begin their relationship, so when it happened, I didn't really care. There was little tension or longing between them. I also found the ending to be unbelievable. Filomena's story is what kept me reading--I found her character to be the most interesting part of the novel. I received an ARC of this book from Goodreads in exchange for a fair and honest review. Every summer around beach time or holiday time I start craving an historical fiction with romance. This is sooo much harder than it sounds. Outlander is not it (for me). I need a good balance of the two genres and I want fairly realistic relationships, not unrealistic bodice rippers or the stuff you can completely turn your brain off to read. This historical romance (hard to label this one, Kirkus - "a period romance built on several layers of love stories." Isn't that lovely? Yes, tha Every summer around beach time or holiday time I start craving an historical fiction with romance. This is sooo much harder than it sounds. Outlander is not it (for me). I need a good balance of the two genres and I want fairly realistic relationships, not unrealistic bodice rippers or the stuff you can completely turn your brain off to read. This historical romance (hard to label this one, Kirkus - "a period romance built on several layers of love stories." Isn't that lovely? Yes, that fits perfectly.) is set in England during World War II. Love gives us a variety of characters: Londoners, the Trombetta family and a few of their friends from their tight-knit Italian community. However, when war breaks out, Italians are seen as enemy combatants. While the war drives many to hate, it drives the star-crossed English -Italian lovers closer together. The Italian men are sent off to internment camps while the British women who love them are left not knowing where the men have been sent. Many have switched papers so that family members can stay together. I have barely touched the surface. This book has a great balance of history, relationships, and how each one affected the other. I learned from it; I got angry with it; I loved it and wanted more. I will be looking out for more by Ms. Love. I rated it a 4.5 because the writing could have been more fluid at times. That’s the description of this latest historical fiction novel and to my surprise…..the description didn’t really match the novel which was unusual for me. I noticed other reviewers noted the same thing. I think what caught me off guard was the implication of an ‘epic romance’ based on the description of the novel. The description, to me, implies epic based on using the war as a backdrop. In most war time romances that I’ve read, they are typically pretty long and the war plays a larger role in t That’s the description of this latest historical fiction novel and to my surprise…..the description didn’t really match the novel which was unusual for me. I noticed other reviewers noted the same thing. I think what caught me off guard was the implication of an ‘epic romance’ based on the description of the novel. The description, to me, implies epic based on using the war as a backdrop. In most war time romances that I’ve read, they are typically pretty long and the war plays a larger role in the story overall. In this book, the war basically served as a period reference rather than playing a larger role or adding anything additional to the plot. I would have liked to have seen the war play a larger role in the drama/romance. There were references to bombings and blackouts but there wasn’t any real mention of how these things impacted the characters or even what they were doing. It lacked action and to me a WWII setting indicates that more action or interaction with the war would be inevitable and for me that didn’t happen in this book in the way that I had hoped. This story was a quick read……at just over 260 pages this book flew by for me! I loved the pace of the novel and didn’t feel like it drug out or anything, the only thing I might have changed was maybe making it a little longer. I felt like the relationship between Antonio and Olivia needed a few more pages to establish and sort things out between them. I liked each of the characters separately but when they came together I wasn’t sure that I was entirely convinced by their romance. It wasn’t that they didn’t have chemistry…..they did but I just didn’t think there was enough established chemistry throughout the story to win me over entirely as a reader. That said, this was a quick read with likable characters. While the romance part was a little wanting, the characters themselves were interesting and I enjoyed watching their development throughout the story. For example, I was intrigued not just by Olivia and Antonio, but Antonio’s sister Filomena had an interesting romantic connection with Constable Harker. I liked that there were other interesting characters in the book to identify with an become invested in. If you are looking for a epic romance that involves the war…..this might not be the book you were hoping for. However if you are looking for a book that is quick to read with interesting characters and a little romance with the war as a backdrop with a hint of a family saga then this will be an enjoyable read for you! I don’t know that I loved it but I definitely liked it! Not to mention the cover is beautiful! It’s eye catching and elegant and totally embodies the beauty and romance of the period! I received ARC of The Girl from the Paradise Ballroom from Edelweiss and publisher in exchange for an honest review. This is one of the books where the blurb and the actual story do not match. We are promised forbidden and powerful love story between Italian immigrant Antonio and beautiful English dancer Olivia. The truth is their love story is very minuscule part and not even the best part of the book. Their love is awkward and lacking sparks or passion. I definitely imagined there would be mo I received ARC of The Girl from the Paradise Ballroom from Edelweiss and publisher in exchange for an honest review. This is one of the books where the blurb and the actual story do not match. We are promised forbidden and powerful love story between Italian immigrant Antonio and beautiful English dancer Olivia. The truth is their love story is very minuscule part and not even the best part of the book. Their love is awkward and lacking sparks or passion. I definitely imagined there would be more sparks between Italian singer and a tango dancer. 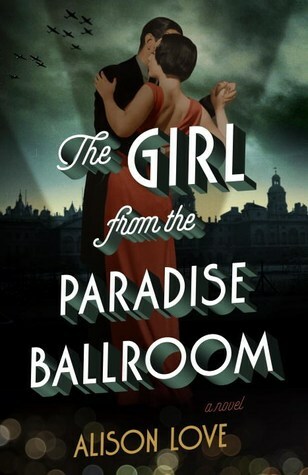 The Girl from the Paradise Ballroom is interesting historical account of life of Italian immigrants and about political and social climate in England on the brink of World War II, which was characterized by mistrust and paranoia toward foreigners and refugees. At that time a lot of Italian immigrants supported Mussolini and even were members of fascist party. This put Italians living in England in precarious position in the time when England was preparing for war with Hitler. Antonio's family was in such position and it was interesting to read about their struggles. I liked both Olivia and Antonio separately as characters but I did not like their story together. I was more interested in Antonio's sister Filomena and Constable Harker relationship which was a lot more compelling. My first love is historical fiction, so getting an ARC of The Girl from the Paradise Ballroom, by Alison Love was cool. I loved the premise of this book, but I had a hard time getting emotionally involved with the characters. Maybe it's just me because there are some great reviews out there for this story, so just take my opinion with a grain of salt and then go read it for yourself. The story stars Antonio and Olivia, two star-crossed lovers of sorts, that chance a meeting at the Paradise Ballroom. Things aren't simple in love (he's married with a baby on the way & she just had an abortion), though, so the two go on with their lives. Now, a lot happens in this story. It takes places over a long stretch of time, and that means there are a lot of players being introduced and POV's to follow. But because I didn't connect with any of the characters, I just didn't care. I respect the authors time in researching World War II, and I found the historical parts very interesting. Love writes about what Italians underwent during the war and what life was like being ruled by Mussolini. So, those portions were interesting to read. It hurts to write this review because I wanted to love the book, instead, I found myself bored and disassociated with the characters, and in turn, the story. I can't pinpoint what would have changed my mind about The Girl from the Paradise Ballroom. I love the era and historical fiction, so the only thing I can put it down to is preference. It wasn't the story, per say, but more so the characters in my opinion. I didn't like them, so their story meant nada to me. Have you read this book? I'd love to hear what you thought of it, especially if you think I'm wrong! This is an emotional roller coaster of a book... Despite the fact that it is set before, during and in the aftermath of WWII, there is pretty much no actual action in the book - the focus is solely on the emotional things going on. There is the dance hall girl turned socialite, the socialite scorning his family with his progressive behavior, the Italian family facing social and political pressure as outsiders in London, the independent sister straining against the cultural and societal roles pla This is an emotional roller coaster of a book... Despite the fact that it is set before, during and in the aftermath of WWII, there is pretty much no actual action in the book - the focus is solely on the emotional things going on. There is the dance hall girl turned socialite, the socialite scorning his family with his progressive behavior, the Italian family facing social and political pressure as outsiders in London, the independent sister straining against the cultural and societal roles placed on her as an Italian and a woman, and the aspiring brother who is only beginning to realize there is more to life than the demands placed on him to be a good Italian, a good son, and a dutiful husband. I'm usually a mystery/action history reader. Like I said, there was no action in this book... they would talk about fear of bombings, joining the war, the blackouts, but just when you thought some of the characters would be involved in some of the action, the next chapter would start with something like, The bombings had begun the week before... instead of talking about where the characters were and what they were doing when that first bomb hit. This is just not that kind of book though. It is an excellent story, and very real as far as the emotional depth and complexities of the characters. When the marital problems between characters are described from each character's side, it's so real that you suddenly find yourself thinking, oh my gosh, could this be my marriage? Is my husband thinking something like that? I give tremendous credit to the author for having as many romantic entanglements in the book as there were, and writing them well without resorting to explicit details. Reading this book was a huge disappointment. This book could have been more romantic, more exciting, the author could have done so much with this book! The title of this book had so much potential for it to be an amazing book or contain lots of excitement, but it doesn't. This book had me not even wanting to even finish it. The entire time I was reading this book, I just wanted to slap the daylights out of every character in this book. If I could have materialized inside this Mmmmm...no? No. NO! The entire time I was reading this book, I just wanted to slap the daylights out of every character in this book. If I could have materialized inside this book I would have been throwing punches left and right because these characters were more annoying than I have ever read in a book. These characters just can't get themselves together, which was aggravating and beyond annoying. The character just lack so much development. I have been on a bit of a WWII kick lately in my reading, but it has been much more diverse than my childhood WWII binge reading ever was. The Girl From the Paradise Ballroom doesn't really discuss the war much, instead it is largely set in the time leading up to it and immediately after it. It is also largely told from the perspective of Italians living in London, which is a new WWII perspect I received a copy of this book through Penguin's First to Read program in exchange for an honest review. Overall I give The Girl From the Paradise Ballroom 4 out of 5 stars because it was unique and interesting. The blurb on the back promised "an epic love story" between an Italian club singer and a tango dancer. This is misleading, as neither of the characters are very well developed, and I had a hard time believing their story. They aren't even the main characters in the book, and rarely shared a page together, let alone any chemistry. It doesn’t feel real, and it’s hard to care about what happens to them or why they feel so strongly they need to be together. It’s a shame, because the author can clearly write, and the stories of the secondary characters such as the main character's sister and her love interest are much stronger. I received a free advanced readers copy from First to Read, in exchange for an honest review. I had a hard time getting into this book. I didn't find the first meeting between Olivia and Antonio to be anything special, so I wasn't sure why it was mentioned in the blurb. Once the story entered the war, the book got better. If you're looking for a pure romance novel, this isn't it. But if you enjoy historical fiction and family stories, you'll I received a free advanced readers copy from First to Read, in exchange for an honest review. If you're looking for a pure romance novel, this isn't it. But if you enjoy historical fiction and family stories, you'll love this. I liked the characters for the most part. I'd have to say that Filomena was my favorite--she was really the one who held the family together. Thanks to Net Galley and the publisher for the opportunity to read this title in exchange for an honest review. Love's "The Girl from the Paradise Ballroom" is a sweet love story about Olivia and Antonio - a pair who met at the Paradise Ballroom before the beginning of WWII. The story glosses over the great difficulties of the time period and focuses more on the forbidden love between Olivia and Antonio as well as the impact that the war and social stations have on both of their families. Most o Thanks to Net Galley and the publisher for the opportunity to read this title in exchange for an honest review. I usually enjoy every book I read for one reason or another. I love historical fiction and from this book I learned more about WWII in London. One of the main characters is Italian, living with his family in London. It really portrayed the racism and the fright of fascism during the war. For me, that was the enjoyable part of the book. However, the main story was a love story, and it just fell flat to me. The story seemed unrealistic and unrelatable, primarily the meeting of the couple which was I usually enjoy every book I read for one reason or another. I love historical fiction and from this book I learned more about WWII in London. One of the main characters is Italian, living with his family in London. It really portrayed the racism and the fright of fascism during the war. For me, that was the enjoyable part of the book. However, the main story was a love story, and it just fell flat to me. The story seemed unrealistic and unrelatable, primarily the meeting of the couple which was the basis of their attraction to one another. I just couldn't connect to the story. But, like I said, I did enjoy some parts. The Girl from the Paradise Ballroom explores the Italian immigrant experience living in England and the forbidden love stories between Italians and English during WWII. Overall, I enjoyed the family drama and learning about the plight of Italians and English during the war...I could have used a little more of the love stories to balance out the drama. See my full review on my blog, Mom's Small Victories. Unfortunately, the characters lacked that spark that sets them apart. I found the book too slow and lacking cohesion, and in general it disappointed. The premise seemed intriguing but the execution was not there. I was really looking forward to reading this novel, however I had a little bit of a love/hate relationship with the experience. I wanted to love it because of the different perspective on the oft told World War II story, but I found it a little convoluted and hard to enjoy to its fullest extent. To start with, the subject matter. The novel is set in England during the early days of World War II and one portion of the novel (a significant portion) is focused on an Italian immigrant family. Throug I was really looking forward to reading this novel, however I had a little bit of a love/hate relationship with the experience. I wanted to love it because of the different perspective on the oft told World War II story, but I found it a little convoluted and hard to enjoy to its fullest extent. To start with, the subject matter. The novel is set in England during the early days of World War II and one portion of the novel (a significant portion) is focused on an Italian immigrant family. Through this family you see not only the immigrant experience during this time, but also how immigrants were treated in WWII England, and how the tendrils of the fascist cause reached into that country too. I do not know very much about the fascists, the state of Italy during the war, and Mussolini, but it was an eye opening experience – and that was something I appreciated. Where I struggled with this story was in caring about the characters. I did not feel like the author did enough in the early stages of the story to make me love them. There was a rather large cast of characters right from the beginning that I struggled to keep up with all of them. So, by the time that the romance between Olivia and Antonio took hold, I did not really care about them as a couple – which is sad because the whole story sort of builds to this and it has a significant impact on the resolution of the story. I also did not really understand the basis for the passionate love between the two – the whole time I found Olivia to have no interest, while Antonio appeared transfixed – it felt contrived to me. I really found the peripheral characters to be vastly more interesting than the main characters and would likely have enjoyed the novel more if they were featured more heavily. I honestly considered putting this book down around the 30% point; I just didn’t care enough about the characters to commit to it. However, I am glad I pushed through as the climax and resolution were really good, but I’m not sure it was ultimately worth the time to get there. As a side note, I think the cover was a great representation of the novel! This story is twofold. On the surface it is about a girl, Olivia, who is a dance hostess at the Paradise Ballroom where she meets a singer, Antonio Trombetta. He is Italian, with an astonishing voice and she is a down on her luck beauty. Their eyes meet across the room and although he can’t stop thinking about her, he is a married man and they go their separate ways. She meets a rich man, Bernard who falls in love with her and they marry. Olivia and Antonio’s path cross again when Antonio helps This story is twofold. On the surface it is about a girl, Olivia, who is a dance hostess at the Paradise Ballroom where she meets a singer, Antonio Trombetta. He is Italian, with an astonishing voice and she is a down on her luck beauty. Their eyes meet across the room and although he can’t stop thinking about her, he is a married man and they go their separate ways. She meets a rich man, Bernard who falls in love with her and they marry. Olivia and Antonio’s path cross again when Antonio helps Bernard home after he is attacked and suffers an asthma episode. To repay Antonio for his kindness, he pays for voice lessons and Antonio’s career takes off. World War II begins in Europe and their worlds fall apart. Suspicions run high against the Italians living in Britain and Antonio fights to protect his father and sister and to hold their lives together. Olivia and Antonio are separated and neither knows what has happened to the other. I enjoyed this book. The story is told in the third person. The author gives you a taste of what is to come in the first chapter and then you go back in time. The characters are rich and well written. The storyline holds your attention because there are actually two stories. The first involves Antonio’s singing career and his interactions with people outside the Italian community. The second involves his family life, including his wife, father, sister and brother. He is the oldest son and he fights to hold the family together and do what is right. She does a wonderful job of blending these two stories together to weave a story rich in character but also history. This story can be read and enjoyed by teenage to adult readers. I enjoyed it because it not only presented a very understandable, page turning tale, it also did what I feel any great historical fiction novel should do, it provokes the reader to explore more about this period of history which is many faceted and has many stories that need to be told. I requested and received this book for review from Blogging for Books. While the book has its share of romantic storylines, including some forbidden love, for me the real highlight was the slice of life type scenes we I'm a sucker for a good historical fiction novel, especially one that explores different cultures (rather than just set in the American past, that is). The Girl from the Paradise Ballroom excels at this, weaving together multiple storylines (Olivia the dancer, Antonio the singer, and their assorted friends and family) with the backdrop of WWII Europe. I received this book from The Reading Room to read and review. This book is set in England beginning in the fall in 1937, a couple years before the start of World War II started, and it starts with a brief meeting between two strangers, an Italian singer name Antonio and a dance hostess named Olivia, who have no idea how much of an impact that meeting will have on the rest of their lives. Months go by and by the next meeting between Antonio and Olivia, things are very different for the both of th I received this book from The Reading Room to read and review. Months go by and by the next meeting between Antonio and Olivia, things are very different for the both of them. Olivia is now married to a wealthy man who also happens to be Antonio's new benefactor, yet one other thing binds them together; a secret from their first encounter. As Olivia tries to distance herself from Antonio, fate and a series of heavily impacting events have other ideas for them, for they are more alike than they realize. This story is about family, heritage, strength, devotion and though things are constantly changing, through times if war and all it brings, love and hope have the power to sustain through it all and conquer differences. I received an ARC of this book from LibraryThing in exchange for a fair and honest review. I'm really divided about this book. The word “epic” was used to describe Antonio and Olivia's love in this book and I found absolutely nothing epic about it. Their first meeting is far from romantic, in fact it was a disaster. They assumed the worst about each other and consequently spent the next 100+ pages avoiding each other. Yet somehow, I'm supposed to believe that they fell in love with each other in I received an ARC of this book from LibraryThing in exchange for a fair and honest review. On the other hand, it was very well written. It was fast paced, but never rushed. I loved reading about the Trombettas, their family dynamics and way of life. It was all kind of new to me, and I really felt for the women of the family. I think I spent most of the book rooting for Filomena more than anyone else. I thought she was by far the most interesting character in the book. Romance is out of my comfort zone, but this historical romance was certainly worthwhile and poignant reading. This novel was bittersweet but satisfying--set against a World War II background in England but, using as an example, a close-knit Italian family, the Trombettas, to illustrate the prejudice against Italians at that time. Their internment in special locations, was similar to that of Japanese-Americans in the U.S.. Both are stains upon their countries' honor. A young Italian singer meets Romance is out of my comfort zone, but this historical romance was certainly worthwhile and poignant reading. This novel was bittersweet but satisfying--set against a World War II background in England but, using as an example, a close-knit Italian family, the Trombettas, to illustrate the prejudice against Italians at that time. Their internment in special locations, was similar to that of Japanese-Americans in the U.S.. Both are stains upon their countries' honor. A young Italian singer meets a dance-hall hostess. Both of them are thrust into the world of the glitterati and feel they are fish out of water. Their love will be doomed. There is also a sweet romance between the singer's sister and an English policeman. I enjoyed reading a different perspective on the War. The love stories were only a small part of the novel--no bodice-ripper here. All the characters were realistic and fully fleshed-out. I thank Library Thing for sending me this in exchange for an honest review. This was a very entertaining and interesting story that really held my interest. I love stories from this time period. While most of them are mostly talking about the war and what Germany was doing, this one hinted at Germany. But for the most part, it dealt with England and how they were dealing with the war. Whether there was going to be a war, where it would play out and what about all the refugees that had fled to their country. It was also about several love stories and about stories that r This was a very entertaining and interesting story that really held my interest. I love stories from this time period. While most of them are mostly talking about the war and what Germany was doing, this one hinted at Germany. But for the most part, it dealt with England and how they were dealing with the war. Whether there was going to be a war, where it would play out and what about all the refugees that had fled to their country. It was also about several love stories and about stories that really didn't have any love. It was well written with great characters and had me rooting for a certain couple throughout. It was wonderful and bitterly sad as well. I would recommend this book. At the onset of World War II, in England, Olivia meets Antonio at the Paradise Ballroom. She is a dance hostess and he is an Italian singer. There is an instant and electric attraction between the two of them. Olivia meets and marries a wealthy businessman who becomes Antonio's patron. She is terrified Antonio will reveal a secret that will ruin her marriage. They manage to control their attraction to each other for several years, until one day they finally come together. With the war becoming a At the onset of World War II, in England, Olivia meets Antonio at the Paradise Ballroom. She is a dance hostess and he is an Italian singer. There is an instant and electric attraction between the two of them. Olivia meets and marries a wealthy businessman who becomes Antonio's patron. She is terrified Antonio will reveal a secret that will ruin her marriage. They manage to control their attraction to each other for several years, until one day they finally come together. With the war becoming a reality and the Italian interment, they are separated. I won this book from Goodreads. It's not a genre I usually read because it's a romantic, historical fiction and I usually read mysteries. I'm always looking for new authors to read and this peeked my curiosity. This Girl From The Paradise Ballroom is about the struggles of an Italian-British family trying to survive despite their homeland country being at war with their new country. It's also the story of forbidden love not only between Antonio and Olivia but between Filomena and Constable Harke I won this book from Goodreads. It's not a genre I usually read because it's a romantic, historical fiction and I usually read mysteries. I'm always looking for new authors to read and this peeked my curiosity. This Girl From The Paradise Ballroom is about the struggles of an Italian-British family trying to survive despite their homeland country being at war with their new country. It's also the story of forbidden love not only between Antonio and Olivia but between Filomena and Constable Harker. I received an ARC of this book through NetGalley/Blogging for Books, but all opinions are my own. This book was different than the description, but I still liked it. I think the romance part was weak, but it was interesting to learn about how England treated Italian immigrants before and during World War II. The character development could have been stronger, and the ending fell a little flat for me. Overall, I do not feel like I wasted my time reading it, but I think there are better World War I received an ARC of this book through NetGalley/Blogging for Books, but all opinions are my own.